If you’re looking to make your hip consumerism more seamless, Apple would like you to consider the iPhone X. A new minute-long ad features a casually dressed young man walking through an open-air market with a group of friends. Spotting a booth full of fancy hats, he walks in. Anticipating a purchase, he slides his smartphone out of his pocket. And when he sees a brim he likes, all he has to do to buy it is glance at his iPhone X to open Apple Pay—thanks to the model’s new Face ID technology, which promises to use facial recognition to let users unlock their phones more easily, just by looking at them. To illustrate the ease of shopping with these combined features, the commercial uses movie magic to transport the hat instantaneously onto the fashionista’s head. Before long, he’s dancing through the bazaar to the song “Back Pocket” by Vulfpeck, upgrading his wardrobe by simply nodding at the items he likes. By the end he’s sporting a brand new maroon tuxedo, a colorful printed button-down, two-tone wingtips and a couple fistfuls of bling. He’s even teleported—with pyrotechnics—a vintage, bird-upholstered armchair to his mother. Because he’s not just a vain or self-indulgent type, he’s a thoughtful and loving son, too. A fun little buying spree, the spot is a slightly more grown-up sequel to last week’s ad featuring a young girl wreaking rainbow havoc on her high-school by using her face to magically open everything from private lockers and class art cabinets to aquarium treasure chests and scientific skeleton displays—also to promote the iPhone X’s Face ID feature (though not the Apple Pay application of it specifically). 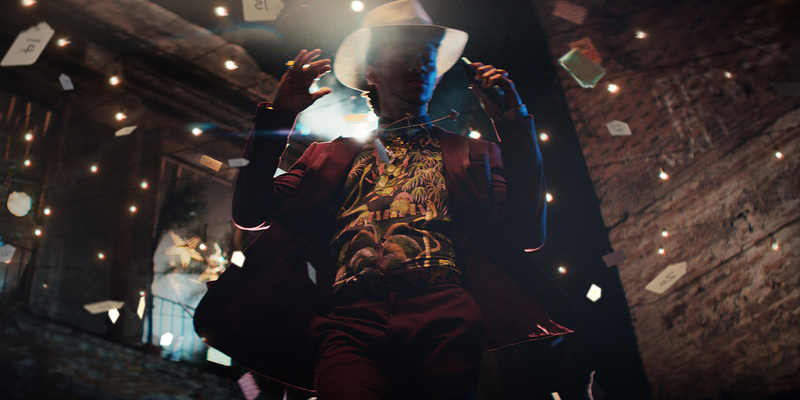 The new ad is a little less clouded by dubious privacy subtext than its predecessor, though there’s always the question of whether a wild bespoke tailoring tear is likely to reinforce the idea of responsible consumer credit usage. Then again, this is America—the land of buying it now, and paying for it later. And if you’re going to buy a $1,000 fashion-statement smartphone, you might as well spring for the outfit to go with it. Setting aside the question of how many (or few) vendors at flea markets might actually take Apple Pay, it’s possible the ad’s hero will save himself approximately seven seconds on each transaction by using it instead of a chip-enabled credit card. That not to mention saving him the trouble of reaching all the way into his pocket again for that pesky retro plastic—or, gasp, cash. It’s also hard not to wonder, though, why he didn’t have his phone in his hand in the first plac. Reasonably, it would be glued there at all times.